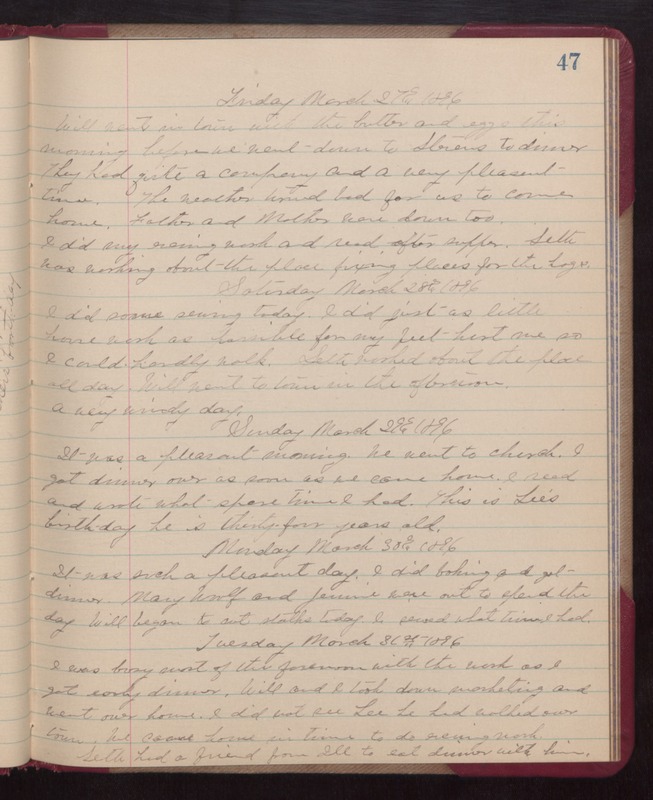 Friday March 27th 1896 Will went in town with the butter and eggs this morning before we went down to Stevens to dinner. They had quite a company and a very pleasant time. The weather turned bad for us to come home. Father and Mother were down too. I did my evening work and read after supper. Seth was working about the place fixing places for the hogs. Saturday March 28th 1896 I did some sewing today. I did just as little house work as possible for my feet hurt me so I could hardly walk. Seth worked about the place all day. Will went to town in the afternoon. A very windy day. Sunday March 29th 1896 It was a pleasant morning. We went to church. I got dinner over as soon as we came home. I read and wrote what spare time I had. This is Lee's birthday. He is thirty-four years old. Monday March 30th 1896 It was such a pleasant day. I did baking and got dinner. Mary Woolf and Jennie were out to spend the day. Will began to cut stalks today. I sewed what time I had. Tuesday March 31st 1896 I was busy most of the forenoon with the work as I got early dinner. Will and I took down marketing and went over home. I did not see Lee. He had walked over town. We came home in time to do evening work. Seth had a friend from Ill to eat dinner with him.